The tagline on my other blog, www.LysandraJames.com, reads, "Chasing dreams and chasing dragons with a laugh and a laptop." Since adopting that mindset, my life has become far better than I ever believed possible. Last Friday, I reached a milestone in my dream chasing - I completed the first draft of my current work-in-progress. It's a YA urban fantasy about the realms of Shadow and Light and those chosen to maintain the border. While it's far from a finished product, it's the result of hard work and persistence. Achieving this goal wouldn't have happened if I hadn't taken the time to nurture and increase the talents my Heavenly Father so graciously bestowed upon me. Classes, books, articles, writing groups and conferences - all have helped me to reach this point in my dream chasing. The Lord encourages us to increase our talents. In the parable of the talents in the New Testament, a man was preparing for a long journey. Before he left, he called together his servants. To the first, he gave five talents; to the second, he gave two talents; and to the third, he gave one talent. A talent was a measure of currency equal to 3000 shekels of silver or gold - not a small sum. The man then left on his journey. While he was gone, the first servant took his five talents and traded with others, increasing his sum by twofold. The second servant did the same. The third servant, fearful of losing his talent, dug a hole and hid it in the earth. After some time, the lord of the servants returned and "reckoneth with them". To the servants who increased their talents, the lord said, "Well done, thou good and faithful servant: thou hast been faithful over a few things, I will make thee ruler over many things: enter thou into the joy of thy lord." The Lord has likewise bestowed upon each of us talents. Some are blessed with many talents, others only a few. These talents are given so we can assist our Heavenly Father in His great work, each according to our predestined role. 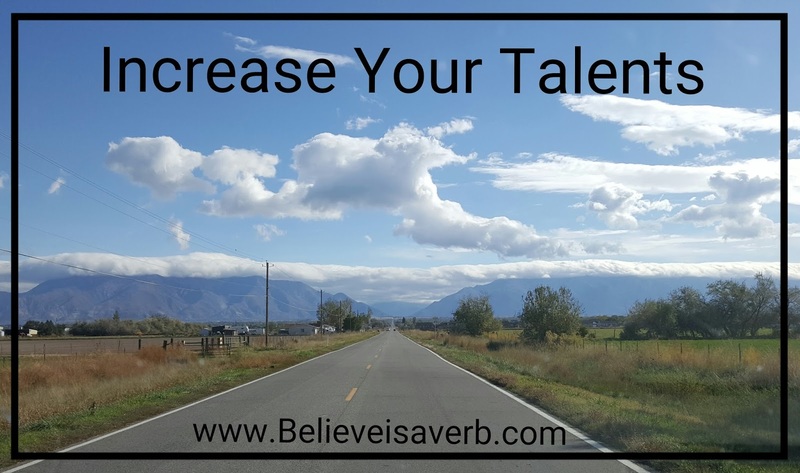 If we work hard and actively seek to improve ourselves, our talents will increase and multiply. However, if we allow our talents to lie dormant, they will fade and be taken from us. Just as a pianist must continually practice to preserve her skill, so must we continually practice in our individual talents to move forward. Talents come in many forms. They can be obvious: music, writing, sports, crafts, leadership. Or they can be subtle: patience, charity, listening ear, belief, endurance. Through introspection and personal prayer, you can uncover your hidden talents and put them to good use. Our Lord desires for us to multiply our talents, to become the best we can be. He needs us to reach our potential so we can build His kingdom. So let your talents shine. Develop them, grow them, share them. Become the soul your Father in Heaven knows you can be. I believe you can do it, too.